The Portland Timbers beat the Columbus Crew in the MLS Cup Final, claiming a 2-1 victory at Mapfre Stadium in Ohio on Sunday. Being a part of the Major League Soccer since 2011, the Timbers captured their first Cup in club history. A fan of clear structures, Crew’s coach Greg Berhalter once again fielded a 4-2-3-1 formation, with Wil Trapp and Tony Tchani being his pivotal pairing in central midfield. Only Kristinn Steindórsson was not available. Other than that, the host of the 2015 MLS Cup Final had free choice, fielding the arguably best eleven players they have. As for Portland, Liam Ridgewell and Fanendo Adi had been questionable, but both the leading defender and Timbers’ recently successful centre-forward stood on the field, when the opening whistle blew. Since October, head coach Caleb Porter has preferred a 4-2-3-1/4-3-3 hybrid system, with Diego Valeri shuttling between a higher number ten and a deeper position within the central midfield block. The Argentine also opened up the final with his early go-ahead goal. Columbus made the most catastrophic start possible, as goalkeeper Steve Clark, after receiving a short back pass, got under pressure and smashed his kick against the onrushing Valeri. The ball deflected over the line for the first goal of the game, with Columbus conceding after only 27 seconds. In that particular scene, Portland already showed their strategy in terms of pressing. Most of the time, they started in a 4-4-1-1 formation, with Valeri being positioned behind Adi, who usually man-marked Trapp. Meanwhile, the Argentine midfielder could pressure the ball-carrying centre-back – or just attack Columbus’ goal-keeper, if the ball returned to him. After the first goal, the home team not only displayed a lack of Gegenpressing intensity, mostly back-pedalling immediately after losing the ball in the middle third, but also played long balls when trying to by-pass Timbers’ first two lines. Centre-forward Kei Kamara then moved to the outside, picking up the ball in a wider area, while right-winger Ethan Finlay usually rushed into the number ten’s space. Columbus, though, had no idea whatsoever how to continue their attacking plays once Kamara received a long pass in a relatively isolated position. Mostly unsuccessful diagonal take-ons or blindly played crosses were the result. Portland, on the other side, were able to extend their lead, as Rodney Wallace made it 2-0 in the seventh minute of the match. Again, the home team were not up to speed, getting caught napping, as they (rightly) thought the ball left the pitch, stopping their actions to take a throw-in. However, the referee waved for play to continue. The Timbers quickly moved the ball forward, exploiting the hole in front of Columbus’s back line. Then, a pass reached Lucas Melano on the right. The winger whipped the ball into the box, finding Wallace who was almost un-marked and headed their second goal. Eleven minutes later, Columbus could take one back, as Portland started to be too passive when defending with two lines of four in their own third. Columbus moved the ball to the right wing, while the Timbers had problems to quickly shift their formation from one side to the other. Right-back Harrison Afful had the time to overview the penalty box and to cross the ball into the red zone. Adam Larsen Kwarasey could not hold on to the ball, so that it ricocheted around the box. Eventually, it was Kamara who picked up the ball and was able to control his effort, finding a little gap to score Columbus’ first goal in the final. As already mentioned, Portland used a 4-4-1-1 formation during the early phase of their pressing. Valeri roamed fluidly behind Adi, while both wingers defended man-orientated against the advancing full-backs. After Columbus entered Portland’s half, the Timbers tried to stay more compactly in the centre, as Valeri positioned himself between Darlington Nagbe and Diego Chará, or he moved to the ball-near half-space to shut down diagonal passing lanes. On the back of their one-goal lead, Portland intended to calm the match down. Their early pass circulation seemed to be slower than during the opening quarter-hour. Once they were two goals down, Crew SC begun to increase the intensity of their Gegenpressing in midfield, as they often lost the ball in the process of trying to play through the middle. Trapp usually dropped between the centre-backs, so that either Tchani was alone in the number six’s space or Federico Higuaín had to move back to support the early build-up play. Either way, it was way too easy for Portland to lead Columbus to the flanks. The hosts were forced to knock the ball forward, praying that Kamara could keep the football until the rest of the team was able to render assistance. Typically though, Kamara was isolated and fought for the ball, while being outnumbered dramatically, and eventually lost possession. Particularly due to Higuaín’s deep position, as he had to help Tchani in central midfield, there was nobody to provide support for Columbus’ lone striker. Only when the full-backs started to play faster and more hazardously to Tchani, accepting the risk of potential interceptions, the hosts had a chance to effectively penetrate the attacking third. After 30 minutes, Tchani received more bold horizontal passes from the full-backs. Immediately afterwards, the Cameroonian played vertical passes to Kamara or a roaming winger. Moreover, Coumbus realised how they could utilize the fact that Adi constantly man-marked Trapp. Because Trapp normally dropped between the centre-backs, both Michael Parkhurst and Gastón Sauro were un-marked, as Valeri – especially during the later stage of the first half – remained to be cautious. Therefore, Sauro moved toward the left half-space behind Adi, who then had to refrain from marking Trapp. In defence, Columbus often used a high press, being structured in an asymmetrical 4-3-3. The first line was compact horizontally, so that they were able to lead Portland’s build-up to the full-backs, keeping them from involving their centre-midfielders, who were covered by the shadows of Kamara and his team-mates. Although Columbus clearly had the intention to draw level, they were back on the front foot immediately in the second half. The Timbers almost put the game to bed on the hour mark, hacking the ball in the penalty area as it rebounded against the post and several players. Columbus seemed to be too passive in defence, particularly having issues with Portland’s half-space overloads. The flat back line was not able to stop Timber’s diagonal dribbles. 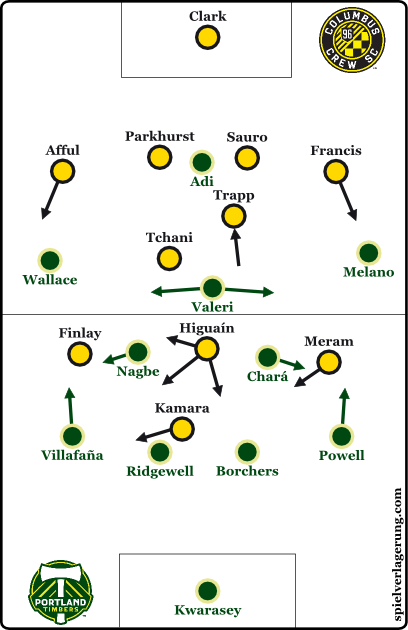 Despite keeping Trapp in central midfielder, when building up in the first minutes of the second half, and intending to by-pass Portland’s pressing line, consisting of Valeri and Adi, by using the outer half-space, the hosts’ build-up play looked sloppy throughout the second half. Especially when Trapp again dropped between the centre-backs, the connection to Kamara was gone. Higuaín repeatedly picked up the ball in the middle. He kept it too long, though, while the two wingers advanced too quickly. Overall, Columbus’ attacking plays were just a stringing together of various individual actions rather than an orchestrated effort. As a consequence, Portland deservedly won the city’s first major sports trophy since the 1970s. After an underwhelming start into the season, Porter found the right tactical structure, mixing flexible positioning in the middle with intelligent pressing. Nevertheless, Clark’s mistake in the first minute of the game as well as the linesman’s micro sleep a few minutes later were helpful. Meanwhile, Gregg Berhalter seems to be a pure advocate of the philosophy that many prefer in the MLS. His system has been clearly structured, but has lacked variations – and therefore moments of surprise. Elements such as a deep-lying midfielder between the central defender have to be scrutinised, when it comes to refining their tactics.